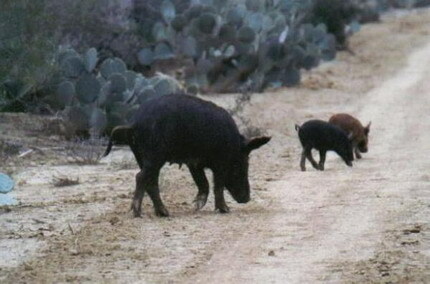 Feral hogs (or Wild Hogs) continue to grow in numbers in Texas and elsewhere. Because of their destructive feeding habits and potential to spread disease, feral hogs are a substantial liability to agriculture and native wildlife in Texas. However, these animals are also sought for recreational hunting and commercial harvest. The resources provided here are intended to increase the understanding of feral hog biology, natural history, damage management, and control techniques. COLLEGE STATION - Landowners who trap feral hogs on their property also need to know about the regulations regarding the transportation, potential release and other means of utilizing these creatures, said Texas AgriLife Extension Service experts. “Landowners in the Plum Creek Watershed of Hays, Caldwell and Travis counties who decide to trap feral hogs should ask themselves what they’re going to do with them after they’re trapped,” said Jared Timmons, AgriLife Extension assistant supporting the Plum Creek Watershed Partnership. Timmons said trapping, then cooking and eating feral hogs is one viable option. However, he added, some people may be averse to eating feral hog or sometimes trapping yields more than can be consumed. “In such instances, moving live feral hogs must meet a set of rules, and this plays into management decisions,” he said. The Texas Animal Health Commission regulates the movement of feral hogs, holding facilities and some aspects of hunting preserves, said Dr. Jim Cathey, AgriLife Extension specialist in wildlife ecology. Cathey said female feral hogs, sows and gilts, may not be transported and released onto another property. A list of approved feral hog holding facilities may be found at the commission’s website at http://www.tahc.state.tx.us/animal_health/feral_swine.html. Male feral hogs, boars and barrows, also may be held for up to seven days in an escape-proof pen or trailer and may be taken directly to slaughter or sold to an authorized holding facility, he said. That facility then may either take them to slaughter or sell them to an authorized hunting preserve. Domestication of feral hogs is allowed, but discouraged as a further option, Cathey said. Timmons said that in addition to damaging the property of Plum Creek Watershed residents, feral hogs also have been identified as possible contributors to non-point pollution of the watershed and may be partially responsible for the water source’s elevated levels of bacteria and nitrogen. “Feral hogs are among the topics addressed in the Plum Creek Watershed Protection Plan, which addresses multiple aspects of water quality and source preservation,” he said. 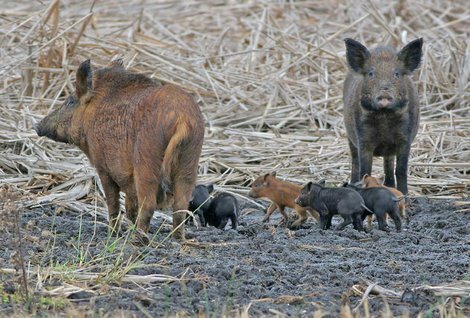 Several publications on feral hogs developed by AgriLife Extension can be downloaded free from the Plum Creek Partnership website at http://plumcreek.tamu.edu/feralhogs. These publications address evidence of feral hogs, hunting and trapping methods and other salient topics. The site also contains online tools for use by landowners and the general public in reporting feral hog sightings or control measures. Funding and support for the development of the Plum Creek Watershed Protection Plan is provided through a Clean Water Act §319(h) non-point source grant from the Texas State Soil and Water Conservation Board and the U.S. Environmental Protection Agency. For more information or technical assistance with feral hogs in Plum Creek Watershed area, contact Jared Timmons at 254-485-4886 or jbtimmons@ag.tamu.edu.